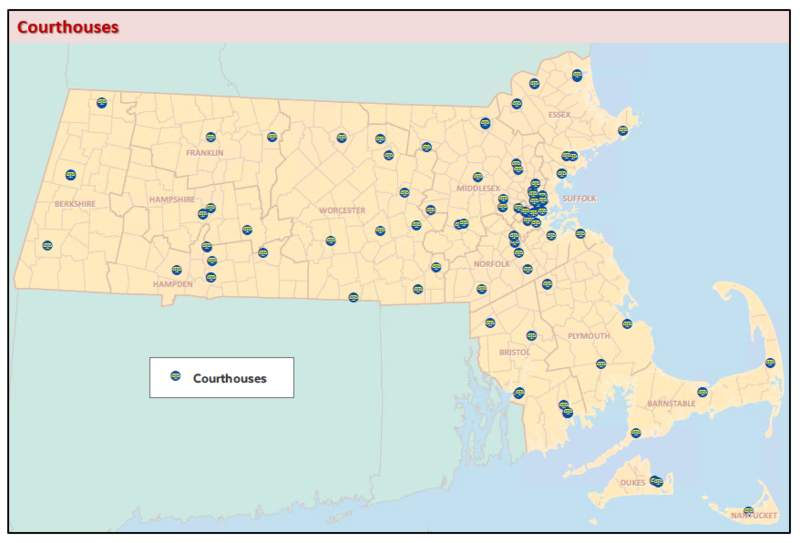 The Courthouses point datalayer shows the location of all courthouses in Massachusetts. The Massachusetts Court System consists of the Supreme Judicial Court, the Appeals Court, the Executive Office of the Trial Court, the seven Trial Court departments, the Massachusetts Probation Service, and the Office of Jury Commissioner. The layer name is COURTHOUSES_PT. 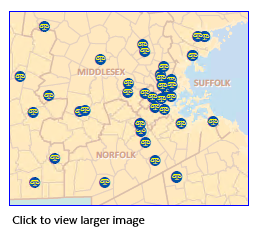 MassGIS received a comprehensive list of facilities in April 2018 from the state's Office of Court Management and matched the addresses to MassGIS' Master Address Points. Physical locations were verified from the Massachusetts Court System using its Alphabetical listing of courthouses. NAME Courthouse name. In instances where multiple courts are housed in the same facility, the highest level of court is the name. SATELLITE Abbreviations of part-time courts within the facility. An "S" will appear in the corresponding individual fields. MassGIS maintains this datalayer and will make updates as needed with input from the Mass. Office of Court Management.